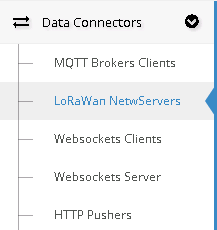 LoRaWan Server is placed under the Data Connector menu. A LoRaWan Network Server is a special Connector that include the functions of a MQTT Broker, for example sending TX and recieving RX, and many other, like sending a Command. The message's structure is equal to the MQTT Broker's one so there is a "head" (the Topic) and the "body" (the JSON). The structure, obviously, depends on the Web Server type. ResIOT provide its own API's for communication with these Servers. - Key Client Certificate: field for Key Client Certificate. The Topic and the JSON Data Patterns are the same as for MQTT Broker. The T1 LoRaWan Server type are different from standard ones.